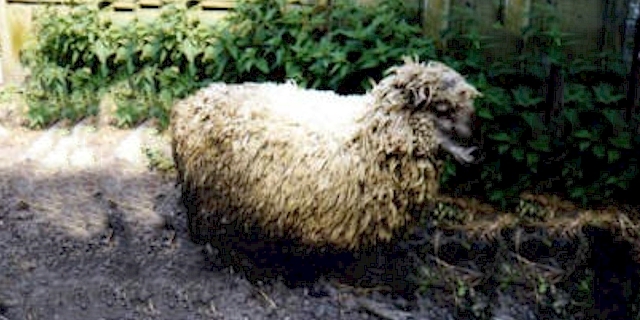 Estonian Ruhnu (also known as Eesti Maalammas) sheep were found on the small Estonian island of Ruhnu in the Gulf of Riga in the Baltic Sea. They are thought to have developed from sheep left on Ruhnu island by Swedish-speaking inhabitants who settled on the island in the fourteenth century. Their total population was documented as 300 in 1944. Currently they are rare, and their total population is around 30 animals. They are a dual-purpose animal were originally raised for both meat and wool. They are medium sized sheep and most of them are white or cream colored with grayish head and legs. Some have a distinctive ‘badgerface’ pattern. Most of the rams are polled, and only around 10 percent are horned. All of the ewes are polled. Their tail is short or medium length. They have double coated wool and are two fiber types and the wool is usually used for making hand knitting yarn and clothing, such as sweaters. The average body weight for rams is around 80 kg. And average live body weight of the ewes is around 50 kg.